Blackjack originates from France and is one the most popular casino games in the world. Similar to slot machines, the players are playing to beat the house. The main objective in blackjack is to get as close to 21 without going over while still beating the dealer's hand. This is done by counting up the value of the cards in your hand. There is a six deck shoe in most online blackjack games. All cards numbered 2 through 10 are at face value. All face cards are valued at 10 while an ace is valued at either 1 or 11 at the player's discretion. Hands containing an ace valued at 11 are considered to be 'soft' hands (i.e. A, 6 is a soft 17), while hands containing an ace valued at 1 are considered 'hard' hands (i.e. A, 6, Q is a hard 17). A blackjack hand is an ace and card valued at 10 (10, J, Q, K). A two-card blackjack always beats three or more cards, which equal 21. Before receiving any cards the player must place a wager. Once the wager is made the player is dealt 2 cards face up. The dealer is also dealt two cards, one face up and the other face down. The dealer's 'hole' card remains face down until the players have completed their hands. At this point the dealer turns over his hole card. If his hand totals a hard 17 through 21 he must stand. If his hand is 16 or under, the dealer must continue to take cards until either his hand is over 16 or 'bust' (which means going over 21). The dealer must hit on a soft 16. 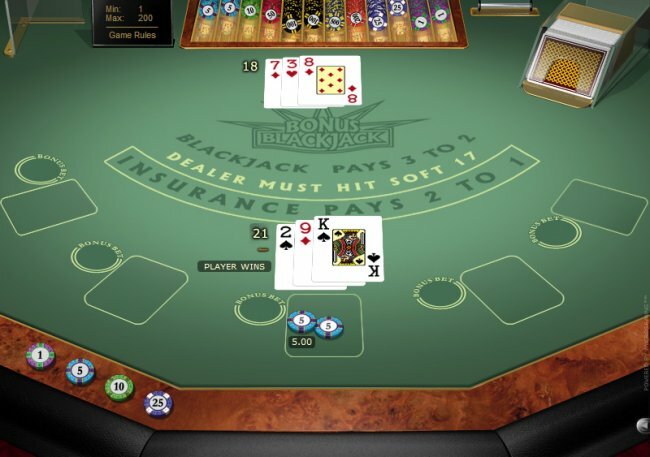 Playing blackjack at online casinos offers a very true-to-life feel. There are a number of game variations available, including bonus blackjack (pictured above), and all of the standard betting options are right at your fingertips. This deals the player another card. If your 2 cards total 10 or less, you have nothing to lose by requesting another card since your total could not exceed 21. This means that the player is satisfied with his hand and does not want to risk another card. A player, after being dealt his first two cards, is always given the option to double the initial wager. Once you have chosen to do this, slide a matching wager next to your original one (or click the 'Double' button if playing at an online casino) and you will be dealt a third card and no more. Your hand will only consist of three cards. When you play online blackjack, if you are dealt two cards with identical value you can then split them (i.e. 8,8 or 10,Q). You would now be playing two separate hands, each starting with one of the two split cards. You will now be dealt a second card to one of the hands. After this hand is played out, the second hand will be dealt a second card and continued until that hand is played out. All regular rules apply to each hand with the ability to double down. You may only split your hand once and a new wager equal to the initial wager will be placed for each split hand. A split hand blackjack pays out at 1:1 rather the normal 3:2. If the dealer's first card is an Ace, there is a possibility that he may have a blackjack. The player can, if he believes the dealer's hidden card is a 10, insure himself against blackjack. If you choose to insure yourself you have to pay an amount of half of your stake. If the dealer gets blackjack, the insurance will pay 2:1 which corresponds to your original stake. If you have insured yourself and the dealer does not get blackjack then you lose your insurance. Your ordinary stake is settled by whatever the dealer gets. Therefore, insurance is to be considered a game of its own within blackjack, and it gives the player a chance to protect himself, when he thinks that the dealer will get blackjack. Players win their wager if their total hand is higher than the dealer's without going over 21. If the player busts, then the dealer wins the hand before turning over a card. All hands that total less than the dealer's hand lose. Hands that are equal in value will be considered a tie, or a 'push', and the player's original wager will leave the table. If the player gets a blackjack the payout will be at 3:2 rather than 1:1. Play blackjack at one of the internet's leading casino sites. Learn what edge the house has for different events, and get tips on playing to win. Improve your game with tips on strategy, card counting, and keeping it cool under pressure. Master basic strategy with charts for single or multiple deck games of blackjack. Practice blackjack strategy with several free no-download games. other popular casino games on your mobile phone. Find out how likely each outcome is to occur, and how different rule variations impact your chances of winning in blackjack odds. Try your luck at a dozen different varieties of blackjack, including multi-hand (pictured) in free table games. Get answers to blackjack topics like beating the house, picking a table, and tips on strategy in our blackjack frequently asked questions. Know the best play for each hand? Cut the house edge by learning basic strategy for single and multiple deck blackjack. Check a running jackpot total and get info about one of the internet's biggest games of progressive blackjack. See which online casinos are paying out the best return rates to blackjack players in table games payouts. Find a preferred place to play with important details for each of our recommended online casinos. Enjoy a game of blackjack on the go with a cutting edge mobile casino.